Preston threw away a two-goal lead to leave manager Phil Brown still searching for his first win since taking over at the rock-bottom Championship club. North End have not won since 11 December and Brown's wait for a victory now extends to seven games after his team failed to hold on to a 2-0 half-time lead at Vicarage Road. His team certainly got off to a great start when Sean St Ledger headed them in front after 39 seconds and Leon Clarke scored his first goal since joining on loan from QPR as the visitors took control by half-time. But Matt Whichelow pulled a goal back with a crisp curling strike and Adam Thompson equalised after North End failed to deal with an optimistic floated ball into their box. Both goalscorers had been brought on at the break by Hornets boss Malky Mackay and it was a spirited comeback by the home team as they avoided a third straight league defeat. Even so, the inexperienced Hornets have now gone five Championship fixtures without victory, a run of form that has seen them slip out of the play-off zone and into mid-table. The evening started terribly for Watford as Preston's 272-minute wait for a goal ended after St Ledger was left unmarked in the Watford area and headed Barry Nicholson's cross beyond Scott Loach. It was the first time that Preston had taken the lead since Brown was appointed. The match was played on a bumpy and greasy surface and a lengthy spell of poor play followed, during which both teams struggled to come to terms with the awful pitch. North End midfielder Nicholson managed to illuminate the contest with a rare moment of quality after 22 minutes but his 20-yard strike was superbly saved by Loach. The Hornets finally opened up the North End defence shortly afterwards but Danny Graham was denied by keeper Iain Turner. And the home team extended their lead when Keith Treacy, who ensured a first half to forget for right-back Lee Hodson, delivered a low cross that Clarke slotted home at the far post. Clarke might have made it 3-0 by the break but Loach again came to his team's rescue, seconds before his team were booed off the pitch. Eddie Johnson and Treacy both went close for North End after the restart but Watford were much improved and pulled a goal back when Whichelow superbly converted Stephen McGinn's lay-off with a 20-yard strike. Preston substitute Darel Russell might have secured victory but his long-range strike cannoned off the crossbar and it was Watford who struck next, Thompson converting at the far post after the visiting team failed to clear Martin Taylor's long ball. Turner had to be alert to tip over a curling free-kick from Don Cowie as Watford pushed for a winner but North End held on for a point to end a run of three straight defeats. 90:00+4:06 The match has reached full-time. 90:00+3:53 The ball is delivered by Danny Mayor. 90:00+1:40 Stephen McGinn has an effort at goal from outside the penalty box missing to the wide right of the target. 90:00+0:37 Darel Russell fouled by Adrian Mariappa, the ref awards a free kick. Free kick crossed right-footed by Barry Nicholson from right channel, Adam Thompson manages to make a clearance. 90:00+0:37 Booking Adrian Mariappa receives a caution for unsporting behaviour. 90:00+0:07 Jamie Proctor has an effort at goal from the edge of the box that misses to the right of the target. 89:51 Adam Thompson delivers the ball, David Gray makes a clearance. 88:52 Outswinging corner taken by Don Cowie from the right by-line, Headed effort from deep inside the area by Martin Taylor misses to the right of the goal. 87:28 Outswinging corner taken right-footed by Matthew Whichelow from the right by-line. 86:30 Andreas Weimann fouled by David Gray, the ref awards a free kick. Don Cowie restarts play with the free kick. 86:06 The ball is sent over by Marvin Sordell, clearance by David Gray. 85:17 Marvin Sordell takes a shot. Save made by Iain Turner. 84:13 Leon Clarke takes a shot. Scott Loach makes a save. 83:12 Adrian Mariappa concedes a free kick for a foul on Danny Mayor. Direct free kick taken by Ian Ashbee. 82:35 Matthew Whichelow delivers the ball, clearance by Sean St. Ledger. 81:11 The ball is swung over by Matthew Whichelow, Sean St. Ledger manages to make a clearance. 79:57 Centre by Darel Russell, Scott Loach makes a save. 78:21 Martin Taylor provided the assist for the goal. 78:21 GOAL - Adam Thompson:Watford 2 - 2 Preston A goal is scored by Adam Thompson from close range low into the middle of the goal. Watford 2-2 Preston. 77:57 Substitution Danny Mayor comes on in place of Adam Barton. 76:52 The referee gives a free kick against Darel Russell for handball. Scott Loach takes the direct free kick. 76:25 Darel Russell has an effort at goal from outside the area hitting the post. 75:01 Corner taken right-footed by Don Cowie from the right by-line, clearance made by Ian Ashbee. 74:48 The ball is crossed by Danny Graham, clearance made by Sean St. Ledger. 74:21 Inswinging corner taken right-footed by Don Cowie from the left by-line to the near post, Darel Russell manages to make a clearance. 73:24 Substitution Darel Russell comes on in place of Keith Treacy. 72:45 Substitution Marvin Sordell joins the action as a substitute, replacing John Eustace. 72:28 Keith Treacy has an effort at goal from 35 yards and went wide left of the target. 71:49 The ball is crossed by Jamie Proctor, Effort on goal by Keith Treacy from deep inside the penalty area misses to the right of the target. 70:06 Danny Graham is caught offside. Indirect free kick taken by Iain Turner. 68:10 The assist for the goal came from Stephen McGinn. 68:10 GOAL - Matthew Whichelow:Watford 1 - 2 Preston Matthew Whichelow fires in a goal from the edge of the penalty area to the bottom right corner of the goal. Watford 1-2 Preston. 66:30 Corner taken by Adam Barton played to the near post, save by Scott Loach. 66:01 Adam Barton takes a inswinging corner to the near post, clearance by Matthew Whichelow. 65:50 The ball is sent over by Jamie Proctor. 64:51 Substitution (Preston) makes a substitution, with Jamie Proctor coming on for Eddie Johnson. 63:37 Stephen McGinn fouled by Barry Nicholson, the ref awards a free kick. John Eustace takes the direct free kick. 62:04 The ball is crossed by Barry Nicholson, Shot from deep inside the area by Eddie Johnson clears the crossbar. 61:19 The ball is crossed by Lee Hodson, clearance by Leon Cort. 59:32 The ball is sent over by Lee Hodson, save by Iain Turner. 58:12 Lee Hodson sends in a cross, save made by Iain Turner. 56:58 Unfair challenge on John Eustace by Sean St. Ledger results in a free kick. Scott Loach takes the free kick. 56:45 Inswinging corner taken right-footed by Adam Barton, clearance by John Eustace. 54:57 The ball is swung over by Don Cowie. 54:33 Corner taken by Don Cowie from the right by-line, Leon Cort makes a clearance. 54:06 John Eustace takes a shot. Sean St. Ledger gets a block in. 53:24 Foul by Keith Treacy on Adam Thompson, free kick awarded. Don Cowie crosses the ball from the free kick right-footed from right channel. 53:24 Booking Keith Treacy is given a yellow card. 52:34 Free kick awarded for an unfair challenge on Matthew Whichelow by David Gray. Adrian Mariappa crosses the ball from the free kick right-footed from left channel. 52:34 Booking The referee cautions David Gray for unsporting behaviour. 50:43 Danny Graham takes a short corner. 50:12 Unfair challenge on Matthew Whichelow by Barry Nicholson results in a free kick. Direct free kick taken by Adrian Mariappa. 47:51 John Eustace challenges Adam Barton unfairly and gives away a free kick. Adam Barton takes the direct free kick. 47:14 Foul by Matthew Whichelow on Barry Nicholson, free kick awarded. Iain Turner takes the free kick. 47:01 The ball is swung over by Lee Hodson, clearance by Adam Barton. 45:01 Substitution (Watford) makes a substitution, with Matthew Whichelow coming on for Lloyd Doyley. 45:01 Substitution (Watford) makes a substitution, with Adam Thompson coming on for Daniel Drinkwater. 45:00+1:25 The ref blows to end the first period. 45:00+1:09 Ian Ashbee takes a shot from just outside the penalty area which clears the crossbar. 45:00+1:02 Keith Treacy takes the inswinging corner, save by Scott Loach. 45:00+0:31 Leon Clarke takes a shot. Blocked by Martin Taylor. 41:00 Free kick awarded for a foul by Adam Barton on Stephen McGinn. Free kick crossed right-footed by Lee Hodson, Sean St. Ledger manages to make a clearance. 41:00 Booking Adam Barton is given a yellow card. 40:16 Eddie Johnson concedes a free kick for a foul on Lloyd Doyley. Scott Loach takes the direct free kick. 39:22 Corner taken by Adam Barton, clearance by Adrian Mariappa. 38:50 Centre by Billy Jones, Adrian Mariappa makes a clearance. 36:33 Keith Treacy provided the assist for the goal. 36:33 GOAL - Leon Clarke:Watford 0 - 2 Preston Leon Clarke gets on the score sheet with a goal from close range to the bottom right corner of the goal. Watford 0-2 Preston. 34:54 Lee Hodson crosses the ball, Iain Turner makes a save. 33:40 The ball is sent over by Billy Jones. 32:41 Short corner taken by Don Cowie from the left by-line. Daniel Drinkwater crosses the ball, Adrian Mariappa has a headed effort from close in and clears the bar. 32:35 Centre by Don Cowie, Leon Cort makes a clearance. 31:02 The ball is crossed by Danny Graham. 28:33 Danny Graham takes a shot. Save by Iain Turner. 27:45 The ball is crossed by Don Cowie, Danny Graham produces a header from inside the area that goes over the crossbar. 27:38 The ball is crossed by Adrian Mariappa. 24:44 Unfair challenge on Leon Clarke by Martin Taylor results in a free kick. Free kick crossed left-footed by Keith Treacy from right channel, save by Scott Loach. 21:58 The ball is sent over by Billy Jones, clearance by Lloyd Doyley. 21:32 Barry Nicholson takes a shot. Save by Scott Loach. 17:45 Centre by Adrian Mariappa, clearance made by David Gray. 14:56 Unfair challenge on Adrian Mariappa by Keith Treacy results in a free kick. Scott Loach restarts play with the free kick. 12:11 Danny Graham delivers the ball. 10:20 Don Cowie delivers the ball, clearance made by Leon Cort. 7:31 Keith Treacy sends in a cross. 4:43 The offside flag is raised against Eddie Johnson. Free kick taken by Scott Loach. 0:39 Assist by Barry Nicholson. 0:39 GOAL - Sean St. 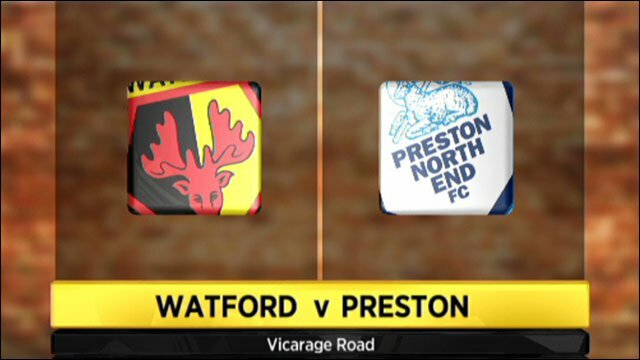 Ledger:Watford 0 - 1 Preston Sean St. Ledger scores a headed goal from close range. Watford 0-1 Preston.